In thrilling fashion, both all-star clubs went toe to toe exchanging the lead throughout the game. 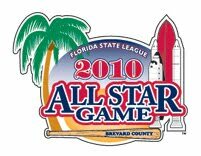 It wasn't until the top of the tenth when the South Division knocked in the winning run to take a 5-4 win in the 49th annual Florida State League All-Star Game on Saturday night at Space Coast Stadium. The game time festivities began prior to the game with the home run derby. Stone Crab's Henry Wrigley edged out Bradenton's Quincy Latimore to earn the league's home run crown. Then came game time. The South Division jumped out to an early lead in the first inning. Latimore and Josh Satin led off the inning with back to back singles. Tony Cruz moved both runners along with a ground out to second. Wrigley knocked in the first run of the game with a ground out to third, scoring Latimore and giving the South Division a 1-0 lead. The North came back to take the lead in the bottom of the third inning. Jack Rye doubled to left to lead off the inning. Gustavo Nunez followed with a single to right, moving Rye to third. Brett Jackson tied the game with a soft liner to right, scoring Rye. Nunez would later score on a ground out by Travis d'Arnaud to give the North a 2-1 lead. But the South would battle back to tie the game once again in the fifth inning. Xavier Scruggs went deep with a solo home run to right that tied the game 2-2. The North Division broke the tie ball game in the seventh inning. Erik Komatsu singled to left then advanced to second on an error. Rye would then single to center, moving Komatsu to third. Rye moved into scoring position by stealing second, giving the North two runners in scoring position. Marquis Fleming intentionally walked Kody Kaiser to load the bases with one out. Then Matt Cline hit into what appeared to be an inning ending double play, but the wild throw by Josh Satin allowed two runs to score and gave the North the lead again, 4-2. The lead did not last long as the South wasted no time in tying the game, striking for two runs of their own in the eighth inning. Richard Racobaldo singled to lead off the inning. Satin then redeemed himself for the error an inning ago by slamming a two run home run to tie the game 4-4. The game stayed tied through the end of the ninth, forcing extra innings. In accordance with FSL rules, there would only by one extra frame and should a winner not be determined, the game would result in a tie. That would not apply because the South Division decided a tie wasn't good enough and went straight for the win. Latimore singled to short to lead off the tenth. Latimore moved into scoring position by stealing second. Satin plated the winning run with a single to right that scored Latimore and gave the South Division the 5-4 margin of victory. Stone Crabs pitching earned both the win and save with Jose Satow earning the victory and Zach Quate recording the save. St. Lucie's Josh Satin was the game's Star of the Game, responsible for the tying and winning runs by going 3 for 5 with a home run and three RBI's. As for the Stone Crabs, here is how our all-stars performed. Marquis Fleming: 2 runs on 2 hits with a walk in 1 inning. Zach Quate: no runs, no hits, 2 strikeouts in 1 inning to get the save. Josh Satow: no runs, no hits, 3 strikeouts in 1 1/3 innings to earn the victory. Neil Schenk: no hits, 1 strikeout, 1 walk in 1 inning. Isaias Velasquez: 0 for 4. Stephen Vogt: 2 for 2. Henry Wrigley: 1 for 5 with an RBI, winner of home run derby. Game photos have been posted to the leagues official website www.floridastateleague.com and video/photos will be added to the Manatees coverage partner www.spacecoastbaseball.com later today. Just watched the replay of the game(at least the last inning) on Catch 47, and dang Quate looked great! Was throwing strikes, struck out the first 2 batters on 6 pitches!Wish they would call him up to AA already. He is not as wild as Gorgen was.